Fernando Martínez Heredia (born 21 January 1939 in Yaguajay, Cuba) is a Cuban Communist politician. Martínez was a founding member of the Cuban Communist Party, and as a member of the July 26 Movement, he took part in the revolution which overthrow the Batista dictatorship. 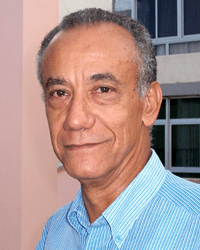 After the revolution, Martínez has written many books and he has worked as head of the Philosophy Department at Havana University.